Listening Library is thrilled to talk horror, audio, and inspiration with Daniel Kraus, the author of two highly-acclaimed novels—both available on audio from Listening Library and recommended for YA listeners 14 and up. (As we like to say, “Listen with the Lights On!”) He is also an editor at the American Library Association and has a brand new YA Lit column called Booklandia, so be sure to check it out! 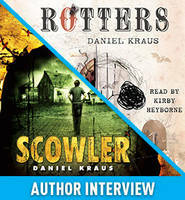 Daniel’s audiobook ROTTERS, read by Kirby Heyborne, was the winner of the 2012 Odyssey Award, given by the American Library Association to the best audiobook produced for children and/or young adults in the United States. Lucky for listeners, and thanks to the SYNC program, ROTTERS is available for FREE download from June 27 – July 3.. And his latest audiobook, SCOWLER, also read by Kirby Heyborne, is available now at your local library or wherever books are sold. After Daniel’s Q&A, step into the recording studio with narrator Kirby in this great video. Q: What is special or unique about the horror genre? Why do you gravitate toward writing horror stories and what do you think this genre gives to teens? A: With the possible exception or romance/erotica, it’s the one genre that tries to elicit a specific emotional, and even physical, response. I think the attraction for this kind of visceral thrill is strongest when you’re a teen. It’s the age when kids decide it’d be fun to drive too fast or jump off a cliff into a reservoir or experiment with drugs or whatever. It’s no wonder that teens want to experience some of these transformational thrills in their literature too. Some of us get addicted to that thrill of pushing past safe boundaries and we never stop, and that’s how you end up with writers like me. Q: In all of your books, you seem fascinated by small towns in the Midwest – and yet you live in a big city. What draws you to this setting? A: There is plenty to be scared of in the city. But for me, the endless stretches of nothing in the Midwest are what’s scariest. It’s almost like being in outer space. No one can hear you if you scream. No one can reach in time to save you. You could run, but the distances are great and you probably won’t make it. The isolation of the country can do strange things to people, but you’d never know it when you zoom by some farm house doing 80 on the interstate. A: In my case, I think it’s best that I *don’t* think about the audiobook process when I write. If I did, it might make me worry “How in the hell is Kirby going to do *this*?” Case in point is Scowler’s voice in SCOWLER, which basically looks like this on the page: “Tk-tk, hr’wo-gep-gep-gep.” Of course, to write dialogue like that you have to have some sense of what it sounds like, and I communicated that to Kirby once he was ready to record the audio, and I think it helped. 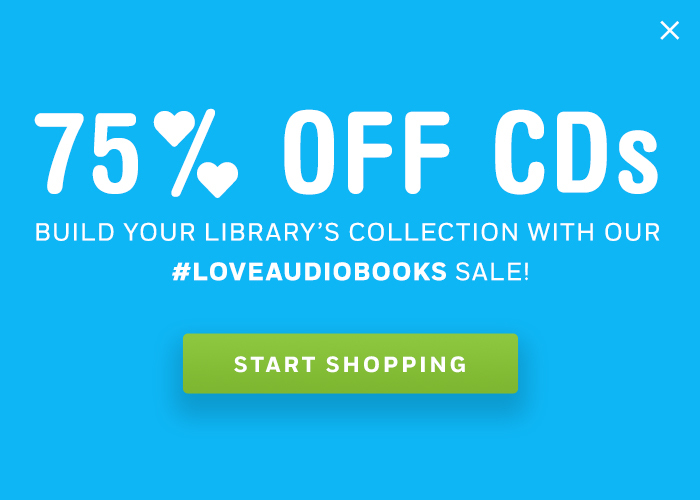 Q: We include your titles on our Guys Listen website and we constantly hear from librarians and teachers that your books and audios have been perfect to place in the hands (or headphones!) of their male patrons and students, many of whom are considered reluctant readers. What do you think are the biggest challenges in helping guys discover stories that speak to them and encourage a love of reading? How does it make you feel to know you have the ability to reach this audience? A: It’s difficult to answer this based on my personal experience because I always loved to read. What fostered that love, however, availability. I never read the books that were put in front of me at school, which I think turned reading into an act that felt a little daring and subversive. I’d go wander the adult stacks looking for the most unsettling stuff, or pick something off my sister’s shelves that boys weren’t “supposed” to read, or snoop around in my parents’ room until I found something even more illicit. The hunt was almost as exciting as the reading. Once you frame it this way, the reluctance slips away. This isn’t unique to boys, but it’s certainly a way to present the idea of reading to them. Q: We also include your titles on our Kids & Bullying: Audiobooks for Conversation website, as your books not only tell gripping and unique tales but they also confront important topics from bullying and abuse to poverty. Do you set out to tell a story that addresses specific issues that you feel are important and/or underrepresented in teen literature? A: Never, never, never. Setting out to tackle a particular “issue” would be death to my writing. I’d feel like I was merely plugging a curricular hole. Tell a story, as deeply and richly and honestly as you can, and real issues will present themselves. Then you’ll fight through them. That’s what a writer does.